Remember in school having to run the mile? I walked. I’d jog a few steps when the gym teacher would yell at me, but then I’d go right back to walking my 16 minute mile. Soccer? I never liked soccer: too much running. Softball was more my speed, but I only played that for a few years. Then, one summer in college, a friend convinced me to run. Several times a week, we’d head out to a beautiful 4-mile lake near campus, and go. I started jogging 1 minute at a time and slowly built up to more running than walking the 4 mile trail (and a 20 lb weight loss!) But, I definitely wasn’t a runner and could never complete the 4 mile loop. A few years later, I enlisted in the U.S. Army. Just to enter basic combat training (boot camp), I had to run 1 mile in 10 minutes. No problem, though I was nervous about it! 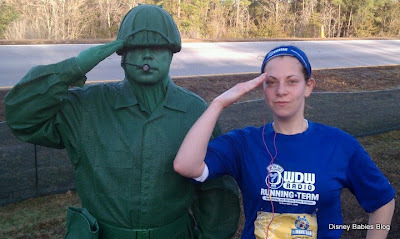 In boot camp, we ran several times a week, either group runs, track runs, or interval training. By the end, I could easily run 2 miles in about 19 minutes. But, I still wasn’t a runner. Before my first WDW Half Marathon, I would frequently head out on a run to stay in shape, but rarely ever more than 3 miles. Heck, 4 or 5 miles seemed incredibly long for me. It was about 7 or 8 months into my first pregnancy- 7-8 months of taking walks and practicing slow yoga, I knew I wanted a change; I wanted to become a runner. I have never enjoyed running, but longed to find a way to enjoy the experience. After all, I have to run for the duration of my career. Then it dawned on me: Walt Disney World. The races run through the parks – and more importantly, through Cinderella Castle! Not convinced? Check out the main page video at runDisney. I’ve almost convinced non-Disney-addicts with that! 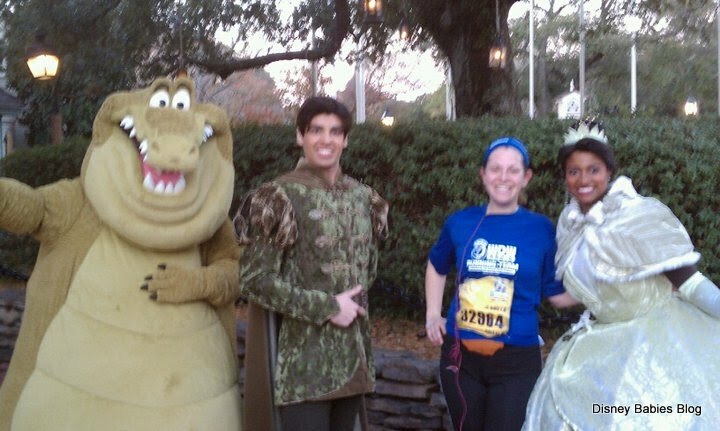 Somehow, at 36 weeks pregnant, I convinced my husband and a good college friend to sign up for the 2011 Disney Half-Marathon. 13. 1 miles. Sounds scary? It does to me, too, but I’ll be running from EPCOT to the Magic Kindgom, and back. And through both parks. Excuse the cell-phone quality pictures! I purchased the “In training for the Disney Half-Marathon” tech shirts for my husband and myself in hopes of motivation. We followed runDisney’s Training Consultant and Olympic marathoner Jeff Galloway’s training programs, and set out on our journey to become runners. Now, I've completed 2 half marathons – my first at Walt Disney World in 2011- a lot of firsts: first half-marathon, first medal, and first run through Cinderella Castle. Since then, I completed a local half marathon and this past January, my husband finished his 2nd (WDW Marathon Weekend 2012) while I watched after completing the 5k the day before. At 26 weeks pregnant, I knew 13.1 miles was too much, so we completed the relaxed 5k. Now, we consider ourselves regulars of runDisney. In 2013, we're planning to experience the Princess Weekend Half Marathon (due to a work conflict marathon weekend). A big thanks to Walt Disney World and runDisney. After years of faking it, I now consider myself a runner. Congrats on completing the 5K. And good luck with the half marathon.